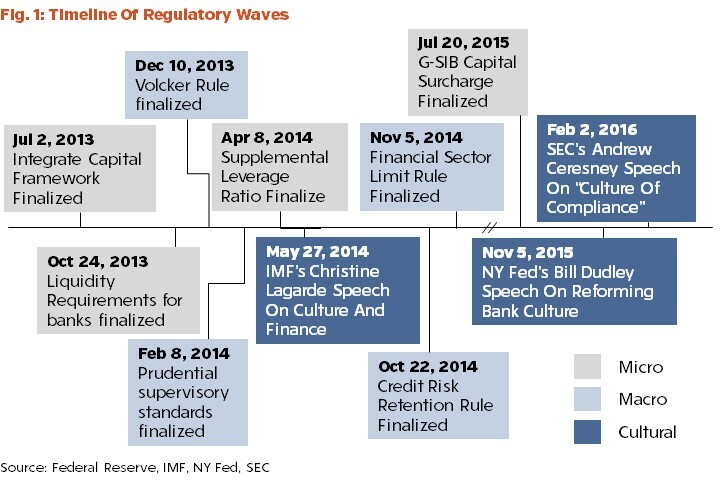 Since the Financial Crisis, we have seen three distinct waves of regulatory activity in the financial sector. An initial focus was placed on micro-prudential rules targeting individual institutions, such as setting higher capital standards and liquidity levels. This was followed by an emphasis on macro-prudential tools targeting the financial industry, including guidance on leveraged lending and the countercyclical capital buffer. With much of Dodd-Frank and Basel implementation now on track, we seem to have entered a third phase, which we will call cultural-prudential. Financial firms are being told that they must ensure that their culture is one that promotes good behavior on the part of their employees. A defining element of this third regulatory wave is that it goes well beyond ensuring that their employees do not engage in bad acts. Rather, the goal is “good compliance, not mere compliance,” and Members of Congress appear more than ready to hold regulators accountable for delivering results.